I love all things chocolate! I used to love a chocolate shake from well just about any where. I wanted to eat and drink healthier and shakes from most fast food and so called healthy food restaurants are loaded with sugar, fat and calories. Drink up and tell your husband or your wife I said “your’re welcome!” Hehehehehe! Alright, it’s late I’m being silly but here is the drink! 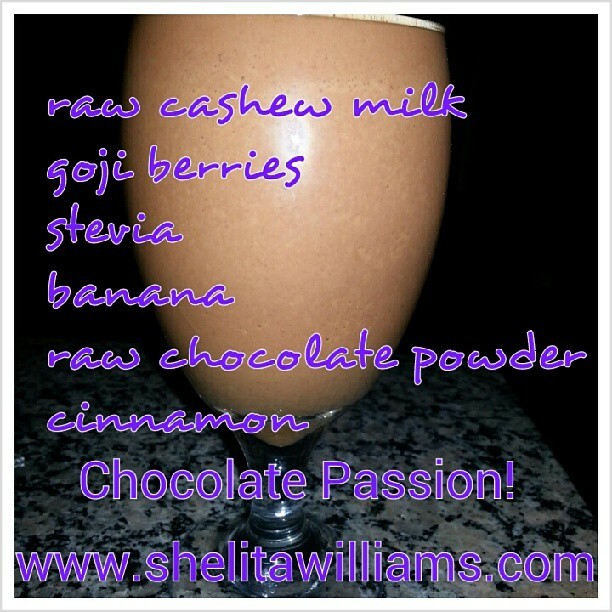 Shelita Williams, Registered Nurse, Certified Fitness Trainer, helps aspiring and established women entrepreneurs who struggle with achieving their health and fitness goals, to lose weight, increase energy, boost confidence and establish brand integrity so that they are poised, fit and motivated to start, manage and grow their business! Sign up for your free eCourse and Reign in Health and Fitness updates!